Dr. John Willis spent 61 years in Christian higher education. Moody Coliseum was brand new and half the buildings on campus today had not been built when Dr. John Willis (’55) returned to his native Abilene in 1971 with his wife, Evelyn (Forrest ’56), and four school-aged children. He brought with him 15 years of experience on the faculty at Lipscomb University and a scholarly vitae that included publications in professional journals of international standing. Two years later, he was honored as Teacher of the Year. Willis retired in May at age 83 after 61 years in Christian higher education, 46 of those in ACU’s College of Biblical Studies. No one who has known Willis in the intervening 44 years is surprised when they see Teacher of the Year among his many honors. Willis was the professor who for decades knew every student’s name in huge sophomore-level Old Testament classes – and remembered their birthdays. 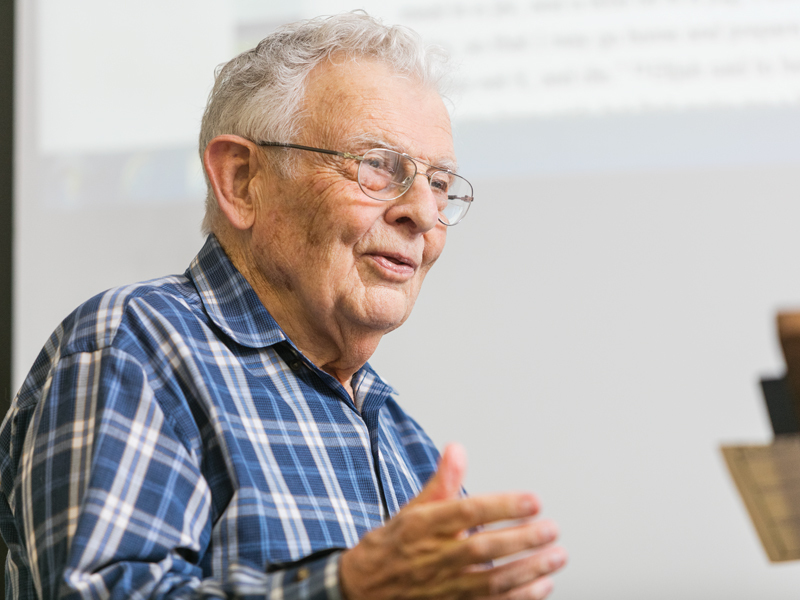 If they came for the cookies he handed out at the beginning Student-focused Bible professor Dr. John Willis retires after 61 years in Christian higher education Dr. John Willis in 1971 JEREMY ENLOWof every class, they stayed for the wisdom and wit. For years he and Evelyn filled their home on Campus Court every Sunday night with students, serving spaghetti or some other student-loved but low-cost meal. These days they’re regularly seen hosting students at Cracker Barrel. Dr. Ken Cukrowski (’84), dean of the College of Biblical Studies, said that when Willis transitioned two years ago to senior scholar with a half-time load his only question was, “Will I still be able to teach students and have an office up here where I can see the students?” He did. It has always been about the students. By the time he retired, Willis had given away somewhere between a half million and a million cookies. A conservative estimate of 200 students per year would seat more than 16,000 in his classrooms – whether the old Roberson Chapel in the Hardin Administration Building or one of the lecture halls in Onstead-Packer Biblical Studies Building. Even those who never took one of his classes knew the diminutive man with the twinkle in his eye and slow, thoughtful way of speaking. Adored by undergrads, Willis was feared and admired by graduate students. Often unknown by those sophomores, but not by faculty colleagues or fellow scholars around the world, is the depth and duration of Willis’ scholarship. He has written approximately 30 books and 100 scholarly articles in Old Testament studies and has been associate editor of Old Testament Abstracts for many years. He remains an active scholar even as he enters retirement. Dr. Mark Hamilton (’90 M.Div. ), professor of Old Testament, and Willis’ son, Dr. Tim Willis (’81), Blanche E. Seaver Professor of Religion and divisional dean of religion and philosophy at Pepperdine University, edited a collection of his articles two years ago. This year he is publishing Images of Water in Isaiah and has other research under way on the promises to David in 2 Samuel. Cukrowski credits Willis with putting ACU on the map. “Dr. Willis, Dr. Abe Malherbe (’54) and Dr. Everett Ferguson (’53) were kind of pioneers – Dr. Lemoine Lewis (’36) got it started. We have more than 200 folks who have graduated from CBS who have gone on for doctorates – more than any other program on campus. That began with that crew,” Cukrowski said. Yet Willis never expected special treatment, never complained about course load, never angled to get the best classes. “He loved teaching and loved students, so it didn’t really matter for him whether it was undergrad or grad,” Cukrowski said. Thus, when given the opportunity to make a final Chapel talk, the international Old Testament scholar just stuck with the theme for the semester, spiritual disciplines, and chose the discipline of listening. Learn more about the College of Biblical Studies. View more from Dr. Cheryl Mann Bacon.